Most of you surely think that you still have got lot of time to decide what you want to give your family and friends for Christmas. At least this is the impression I have every year... with increasing tendency! I remember last year with a kind of horror... I spent two and half months before Christmas - and even two after, my clients having redeemed some gift vouchers - to paint portraits, simply because my clients had decided at the eleventh hour that a portrait would be the most appropriate gift. At the end I was totally saturated, I almost hated all these little monsters and even thought, I could never face a portrait again! But well, in the finaI analysis, I love portraiting, and love the deep pleasure I can give people with it. So i just went on... and here I am again, with the awful impending Christmas rush at my door. 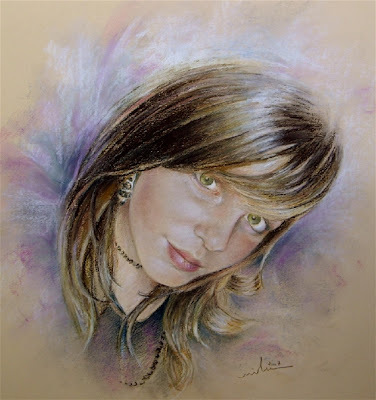 I have been portraiting for a long time, and people who received them as a gift have always thanked me and said, it was the most beautiful present that they had ever had. Today I just want to beg you, if you are thinking about giving a portrait (or any kind of painting on order) please think fast and order now! You must not forget that a portrait takes a long time, a lot of energy and inner peace. I always have to go inside the portraited person to be able to capture his/her soul, and I hate to "jump" from one to the other: it just leads to schizophrenia! And anyway: the longer you wait, the more expensive it becomes... yes, my night rates are very expensive! If you need some help with your decision, have a look at my portraits on Planet Goodaboom. Don´t forget: to order a portrait from me is a very easy process, even if you live on the other side of the world. You just send me the appropriate photo, and choose the size and technique. 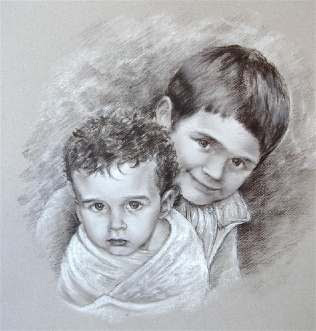 I paint the portrait within 3 weeks (normally! ), send you a photo of the portrait via email, make changes if you wish, and then send you the original via normal post. You normally pay when you get it, as I always choose to trust my clients. I did it many many times, IT´S NOT A PROBLEM AT ALL! And if you think, yes, it could be a good idea: you won´t regret it, I promise!